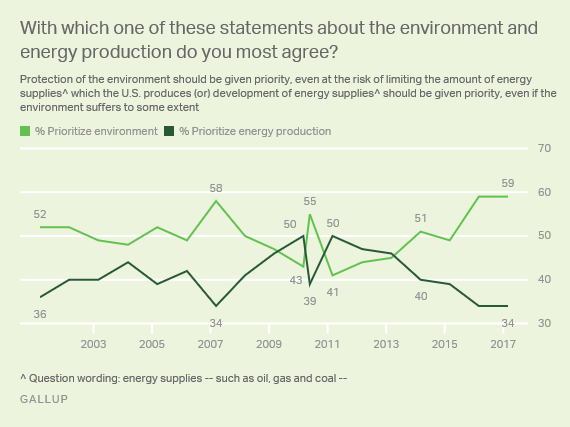 WASHINGTON, D.C. -- Given a choice, the majority of Americans think protecting the environment should take precedence over developing more energy supplies, even at the risk of limiting the amount of traditional supplies the U.S. produces. An even larger majority would prioritize developing alternative energy sources such as wind and solar power over the production of oil, gas and coal. Although these have been Americans' preferences for some time, support in the past two years has been at record highs. 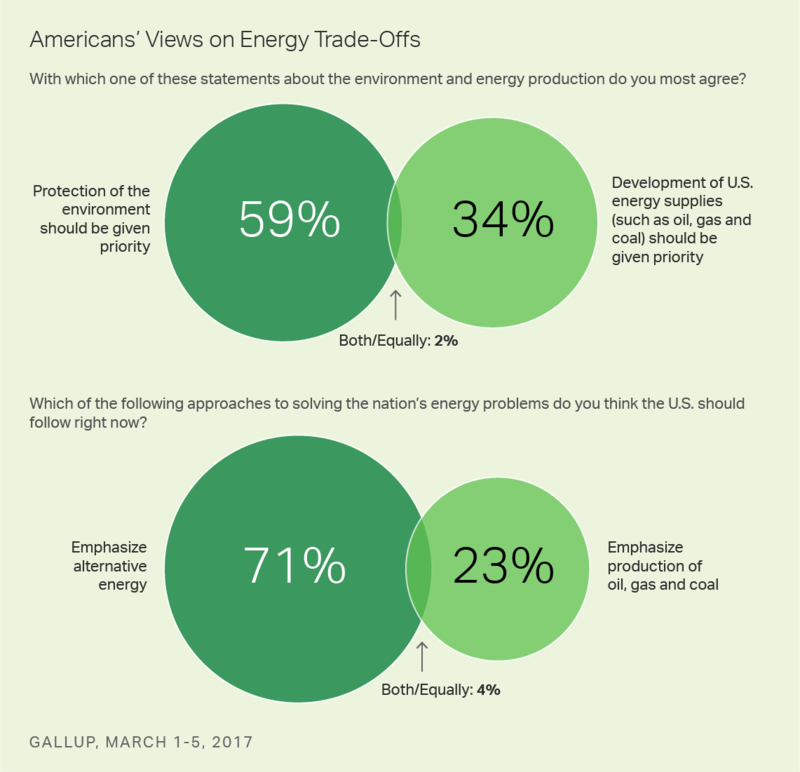 Gallup has asked Americans about the trade-off between protecting the environment and developing oil, gas and coal supplies every March since 2001, including the latest update in this year's March 1-5 Environment survey. The public's attitudes on these issues are particularly relevant as President Donald Trump has proposed rolling back environmental regulations affecting the energy industry, removing a moratorium on federal coal leasing and lowering emissions restrictions on the automobile industry. Americans have usually, but not always, favored the environment when given this choice. The exceptions came in early 2010 and from 2011 through 2013 as the nation recovered from the Great Recession. Americans' preferences temporarily shifted back toward environmental protection in May 2010, after the massive leak from a damaged BP oil rig in the Gulf of Mexico. The gap has widened in favor of the environment in the past four years. 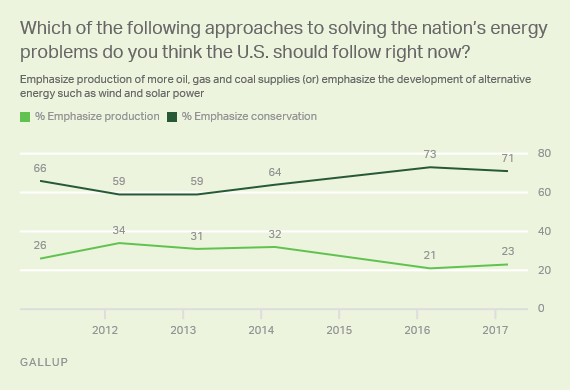 In both 2016 and this year, 59% of Americans have favored the environment versus 34% who have favored the production of oil, gas and coal -- the 25-percentage-point difference is the highest such margin in Gallup's history of asking the question. 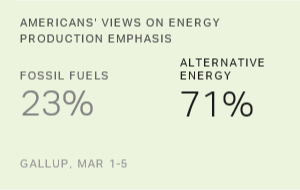 Gallup has asked Americans about the trade-off between traditional and alternative energy sources in every year but one since 2011, and the public has consistently favored the latter, albeit by varying margins. The last two years have seen the largest gaps in favor of alternative energy over the six-year history of this trend. Americans' support for spending more government money on solar and wind power (72% favor) is the highest of any on the list. 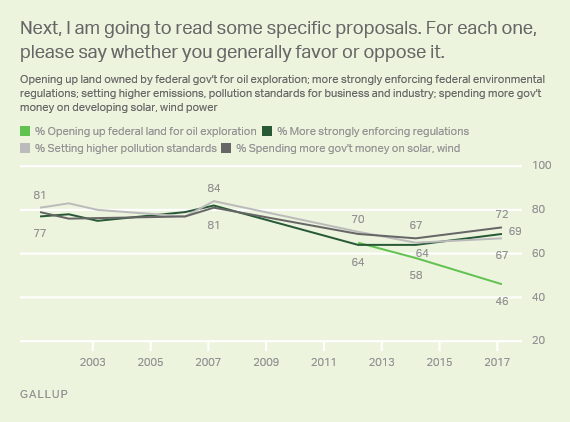 About two-thirds of Americans favor more strongly enforcing federal environmental regulations and setting higher emissions standards for business and energy -- further reinforcing the public's tilt toward the environment versus energy production. Slightly less than half favor opening up more federal land for oil exploration. Broad public support for solar and wind power, stronger environmental regulation enforcement and setting higher emissions standards has been evident each time these questions have been asked since 2001. However, the current support levels remain slightly lower than pre-recession readings. Support for opening up federal lands for oil exploration has dropped from 65% who favored it in 2014 to 46% today. In addition to these findings, a separate question finds that over half of Americans (53%) are opposed to hydraulic fracturing or "fracking" as a means of increasing the production of natural gas and oil in the U.S.; 35% favor it. Production and distribution of the fossil fuels that the nation's economy and people's lives depend on inevitably take a toll on the environment -- leaving the question of how much of this type of a toll society is willing to accept. Gallup trends show public tolerance for hurting the environment to maintain energy supplies is at a low point. One likely reason for this is the perception that the nation has plenty of energy, available at a relatively low cost. Fewer Americans are worried about the availability and affordability of energy than any of 12 other problems measured in the March Environment survey, and worry about energy is the lowest it has been in 14 years. The percentage of Americans rating energy as a serious problem is at a 15-year low, and almost no one mentions energy as the most important problem facing the nation. Underlying views of an abundant and affordable energy supply may free Americans to prioritize the environment and to stress the development of alternative energy. Statistical analysis shows a significant year-by-year relationship between views of the seriousness of the energy situation and views of the trade-offs between traditional energy and the environment, as well as between traditional energy and alternative energy sources. Americans are also now more positive about the economy overall. This increased confidence in the nation's economic situation may suggest to Americans that the nation can bear the economic consequences of an increased focus on the environment or on alternative fuels. Trump is, on the other hand, emphasizing more fossil fuel extraction, opening up federal lands and relaxing environmental restrictions. This presents a potential challenge for the president at a time when large portions of the public appear more interested in protecting the environment and developing alternative energy sources than focusing on oil, gas and coal. Americans could be favorably disposed toward some of Trump's specific proposals if they are linked to jobs or more broadly justified for other reasons. Additionally, the changes in attitudes about the trade-off between the environment and energy over the years show the public could easily swing back to favoring energy production at some point in the future. Results for this Gallup poll are based on telephone interviews conducted March 1-5, 2017, with a random sample of 1,018 adults, aged 18 and older, living in all 50 U.S. states and the District of Columbia. For results based on the total sample of national adults, the margin of sampling error is ±4 percentage points at the 95% confidence level. More than half of Americans are optimistic that Donald Trump can make the country prosperous, but most doubt he will do a good job of protecting the environment. Americans' views of the seriousness of the nation's energy situation and their worry about the availability and affordability of energy are at or near all-time lows.